4 Bedroom Semi Detached House For Sale in Chippenham for Guide Price £775,000. A very pretty double fronted Grade II Listed village home. Little End Cottage was originally two homes and believed to date back to the 17th Century. The current owners have presented it beautifully and have created a delightful and spacious home with period features including stone mullion windows with window seats below plus exposed beams. The central dining hall has a retained stone fireplace with a cast iron range whilst the sitting room has a very impressive Inglenook fireplace with a wood burning stove. The snug has a tall sloping beamed ceiling and leads to a superb kitchen. This is a beautifully designed extension with tall exposed A-framed ceiling and hand made kitchen by ‘Harvey Jones’. Impressive oversized cream flag stone flooring benefits from under floor heating. A further feature is a stunning picture window with glazing reaching the full height allowing the garden to really be part of the room. With plenty of room for a large dining table and sofa this is truly the heart of the house. A winding staircase leads to the first floor also full of charm and character with curved walls, beamed ceilings and views. Both bedrooms on this floor have stone mullion windows looking out to the front. The bathroom has a free standing claw foot bath with a separate shower; there is also a further shower room downstairs. Two further bedrooms on the second floor have tall A-frame roof beams and views to the front looking over your neighbour’s roofs to the beautiful patchwork fields beyond. 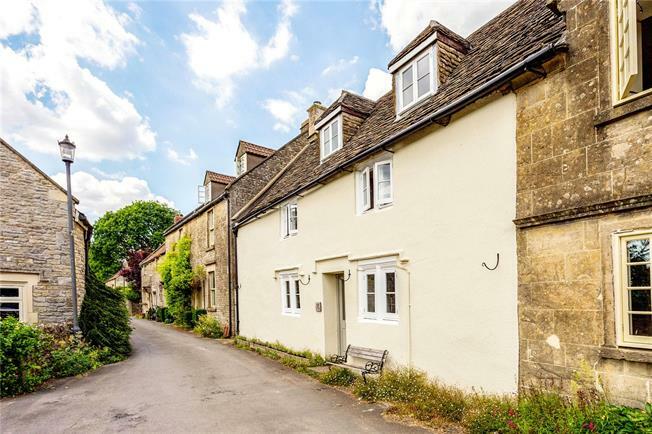 Marshfield is a highly sought after village approximately eight miles north of Bath and also benefitting from easy access to Bristol and Chippenham either via the A420 or the M4 Motorway. The unspoilt High Street is made up of predominantly period homes and essential and lifestyle amenities such as a village store and post office, butchers, tea room, newsagents and pretty furniture shop. There is a popular primary school which was re-built just a few years ago and a choice of public houses as well as the village church and GP's surgery. Little End Cottage is situated on a pretty no-through country lane and has views across an adjacent farm to the countryside beyond. Of particular note is the lovely garden to the rear. There is a pedestrian side gate from the front opening to a handy storage area. A detached stone bothy is a super addition housing a home office. A few steps lead up to a level lawn enclosed by dry stone walling and fencing. There are a number of flower borders including herbaceous planting, mature shrubs and currently a wonderful array of spring flowers. A few fruit trees complete the picture with a back drop of the neighbouring Manor’s orchard in the foreground. A wonderful village garden. Services: All mains connected. Gas central heating. Council Tax Band E.